The Shenandoah Valley Children’s Choir and Shenandoah Valley Youth Symphony Orchestra will perform a fall concert on Sunday, Nov. 20, at 4 p.m. in Lehman Auditorium. The SVCC’s treble and concert choirs will sing a sample from their Christmas concert, including a 15th century German hymn, a traditional Jewish folk song and a festive spiritual. The treble choir members (29 total) and concert choristers (60) range in age from 9 to 18. The orchestra has 42 members, ages ten to 17, who all join through audition. Each musician plays a different part of every piece, “so these students need to be very strong players,” says Program Director Sharon Miller.The orchestra will play a set including Vivaldi’s Cello Concerto in E Minor, featuring solo cellist Cecily Lawton. Lawton, a Harrisonburg High school senior, has been studying the cello for seven years, including instruction from EMU music faculty member Lisa Wright. 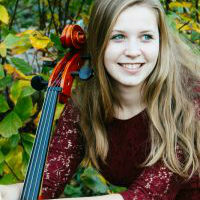 Lawton has been an orchestra member for over four years, and was chosen as this season’s soloist by audition last May. She has been involved in a number of extra-curricular musical organizations, which include playing in the Harrisonburg High School Symphonic Band, volunteering for the Harrisonburg City School Strings program, and forming a string quartet with fellow orchestra players. Maria Lorcas conducts the group, and will lead one of the two collaborative pieces between the orchestra and SVCC – Vivaldi’s “Gloria” and “God Bless Us Everyone” from Disney’s A Christmas Carol.